Non-sterile disposable medical gloves, intended for medical examinations, diagnostic and therapeutic procedures, and for handling soiled medical devices. Ambidextrous powdered glove composed of 5 fingers, a palm and a sleeve. After use, ensure complete destruction by incinerating in a protected area. In a dry place, away from a direct heat source. Cardboard dispensing box with 100 gloves. Labelling on the box: Manufacturers name and address; product name and size; manufacturing date and expiry date; and CE mark. Must be multilingual: English, French and Spanish, others when available. Gloves that are directly derived from latex need to indicate the following: "(product) containing natural rubber latex likely to provoke allergic reactions". Must comply with European Medical Device Directive 92/42/EEC, or equivalent international norm. 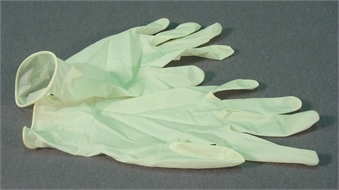 Note: Replaces the older finger sheaths, which absolutely cannot be used anymore due to contamination risks.